Through the Mayor’s Age-Friendly Challenge, we’re looking for practical examples of what age-friendly really means so we can share best practice across the city region. We want to hear about those practical schemes and projects already in place in Greater Manchester, which are helping to make your community and neighbourhood more age-friendly. 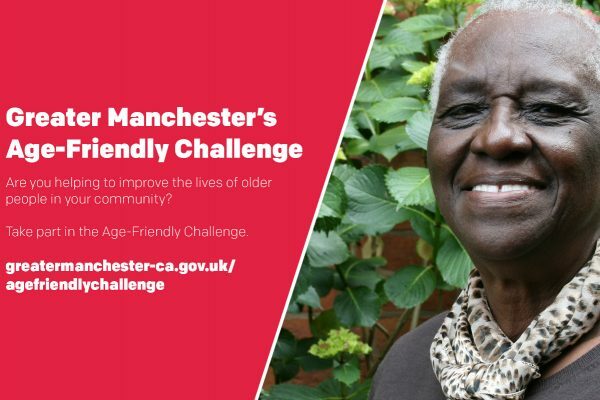 The challenge is open to the voluntary and community sector, public services, and older people’s groups working together to make their community and neighbourhood more age-friendly. Successful applicants will receive accreditation confirming their age-friendly status, and will be announced at the Greater Manchester Age-Friendly Conference in February 2019. The best entries will be promoted by Ambition for Ageing as examples of best practice, including to external funders. Closing date for applications is 1 December 2018.